We arrived in Arizona after our week at Joshua Tree with the federal government still shut down and still throwing a wrench into our plans. Fortunately we had built some flexibility into our schedule, so we decided to hunker down for a week near Quartzsite, Arizona to see how things developed in Washington. The town of Quartzsite sits toward the western edge of Arizona, but inland from the Colorado River. Unlike Lake Havasu City or Yuma, Quartzsite’s harsh desert environment is not mitigated by rivers and man-made lakes. The dry, flat, mostly sunny desert has turned this place into a winter mecca for RVing, on a scale that must be seen to be appreciated. I have never seen so many RV parks, RV services, and actual RVs in one place. But of course this population of visitors is short-lived. This small town swells exponentially in size during the winter months, but is a tiny, dusty desert outpost the rest of the year. The biggest feature of the Quartzsite area is the huge number of well-established desert camping areas. Virtually the entire area surrounding the town — for miles in every direction — is owned by the Bureau of Land Management, and BLM rules typically allow free camping on their land for up to 14 days. When there are hundreds of thousands of acres of available land, people can really spread out and enjoy the desert scenery from relatively private campsites. Since we were not planning to stay more than 14 days, we didn’t head into the relatively busy LTVA. Instead, we enjoyed a site off of Palm Canyon Road, one of the main points of access into the Kofa National Wildlife Refuge. We had only a handful of neighbors within sight, and we were far enough away from town to enjoy dark skies for star viewing. We also had some opportunities for interesting hiking in the wildlife refuge and on the multiuse trails (hiking/biking/OHVs) on the surrounding BLM land. Even more exciting, since so many RVers descend on Quartzsite in the winter, we crossed paths with several people we had previously only met online. We spent a lovely evening enjoying a campfire with a group that was parked about 9 miles north of us and included Tim & Amanda, Dave & Shannon, Jeanette & Eric, Taylor & Beth, Sue, and Marshall. Other than Marshall, whom we had encountered by chance at the Badlands in May, it was our first in-person meeting with this group of fellow full-time travelers. It was fantastic to experience a little community here on the road, and we really enjoyed ourselves. The sign helped us see the palms up on the side of the canyon. Overall, this week was a chance for us to kick back, catch up on podcasts, read books, and generally lounge around, while obsessively checking news sites for information about the government shutdown. Other than getting agitated over the ridiculousness of the shutdown, it was a relaxing week, made even more chill by the fact that we were enjoying free camping. So this seems like a perfect time to talk about boondocking. The RV term “boondocking” refers to camping for free someplace that’s not an established campground, with no services. The most common examples of boondocking are dispersed camping in a national forest and dispersed camping on BLM land. (Parking your RV in a friend’s driveway or back yard for free is “moochdocking.”) The two most important benefits of boondocking are the price (did I mention it’s free?) and the relative isolation. In the world of RVing nightly camping costs can vary greatly depending on the setting — we have paid up to $60/night in a private park — and a cost of $0.00 per night sure helps bring our average camping cost down. But we are not always looking for the most budget friendly option. What we really want is to camp in great places. It’s a perfect marriage when the best camping is also free. In 2018, some of our best boondocking sites (Badlands, Grand Tetons) offered spectacular views while putting us right in the heart of the locations we wanted to visit. In a few other cases, national forest boondocking was just more appealing than any nearby options (like in Tuskegee and in Butte) with the added benefit of being free. Our very first significant boondocking stay, at the Dupuis Reserve near my hometown in Florida, was ideal for getting situated in the rig. In Quartzsite, we saw no reason at all to stay in one of the private parks in town, where we would be squashed in with hundreds of other RVs and have little in the way of privacy or views. Quartzsite was a perfect candidate for boondocking because there are many well-established campsites, and the freebies are better than the paid sites. It was easy to find a large level spot where others had camped before, so we minimized our burden on the fragile desert. Having a small amount of neighbors — none of whom were particularly close by — was also a plus for us because it allowed us to enjoy unobstructed views of the surrounding plains and mountains. The biggest challenge with boondocking — once a suitable site is located — is the fact that there are no services. This means campers need to provide their own water and power, and manage their waste tanks. 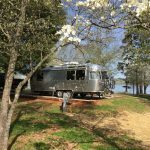 We made several decisions in purchasing the Airstream specifically to improve our ability to boondock, and it had paid off nicely. Conserve water in cooking by making foods that retain all the water you put in. This means very little pasta or potatoes, which involving draining out a lot of water. Instead, we eat plenty of rice/quinoa/couscous/farro and also a fair amount of soup. Cut down on dishes by making one-pot meals. Soup to the rescue again! We mostly do washcloth bathing, with a normal shower being far from a daily occurrence. This also helps keep our skin from turning to dust in the low humidity environment of the desert. When we do take showers, they are “Navy showers” — only turn the water on to get wet and then rinse off, keeping the water off in between. As a result of these conservation measures, we never have any issue with running out of fresh water or overfilling our gray tank (shower and sink waste water). Instead, our limiting factor is our black tank. Given our love of food, we just haven’t found a way to stop filling it. Ken using his star-finder app. That “supernova” is a sliver of a crescent moon. Other than tank management, the big challenge of being off grid is generating power. Our rooftop solar (160 watts) and portable panels (120 watts) are capable of generating enough electricity to keep us fully powered — including recharging electronics like laptops, phones, and camera batteries — but only if there is sufficient sun. At times we’ve struggled to generate power in situations with cloudy weather, or overhanging trees, but Quartzsite is typically very sunny, with wide open skies for maximum solar generation. We even washed off our roof panels during our stay, to keep them generating as much juice as possible. One of the reasons that we can get by with a relatively small amount of solar panels is that we configured and use the Airstream in a manner that relies as little as possible on electricity. For example, our dealer had upgraded our rig with a microwave/convection oven, but when we bought the rig we paid them to remove the upgrade and put in the standard propane-fired oven. There is no way that we could run a microwave oven off our solar panels, and the oven has delivered up plenty of tasty breads, pies, quiches, and roasted foods in situations where we have no electricity hookup. Our main fuel source for cooking and for refrigeration is propane, so our solar panels are able to handle the relatively small electrical load with ease when we have sunny days. We have seen other rigs with far more solar, even up to 1,000 watts, which makes sense if they have much higher electrical needs. Portable panel putting out 9.4 amps! For us, boondocking is fairly similar to national park or national forest camping (where we rarely have any sort of hookups), except without a safety net. Established campgrounds will often have some services, like toilets or spigots with potable water, so campers do not have to be entirely self-sufficient. When we camp in public parks, we often take advantage of these services to help extend our tanks, but boondocking means we are on our own. By now we are comfortable enough with our rig that we know how to handle a week without any services, but it still feels a bit like stepping off a cliff when we pull into a completely unsupported location. I think that has to do with the fact that boondocking is basically unregulated. In an established campground, the sites are designated by numbers and usually have a clear parking pad, a picnic table, and a fire ring. It’s easy to define what outdoor space is “ours” versus the neighbor’s. There is also typically a camp host on site who provides a semblance of authority, even if that person is just a volunteer. We like knowing where other people are going to camp, and having a sense of order in the campground. What can I say? We are people who like rules. When boondocking, there is always the chance that some yahoos will pull in 5 feet away from us, invading our personal space with OHVs, games, music, and loud contractor generators, and there’s really nothing we could do other than move. So we loved the fact that the BLM land around Quartzsite is so vast. There was plenty of room for people to spread out — or cluster in groups if they were camping together — and have the level of privacy that suited them. We’ve generally enjoyed our boondocking experiences, but that’s because we have been selective in the sites we’ve chosen to take advantage of free dispersed camping. Some people are very dedicated to boondocking, spending 90% or more of their time camping for free and constantly searching for great undiscovered places to camp. There is also a trend among that boondocking group to not share the location of their best finds, since people are jerks and these campers don’t want to return next year to find a great location sullied with trash and shotgun shells. We’re not that adventurous. We like boondocking in well-known locations, where many people have camped and we can get accurate advance information about the condition of the roads and the campsites. And we actually like having a few neighbors in sight, so long as they are at a distance. As a result, Quartzsite really worked for us as a boondocking site. Dark skies are just one benefit of being far from neighbors. Next, we head south toward Organ Pipe Cactus National Monument, our last stop before a long stay in Tucson.